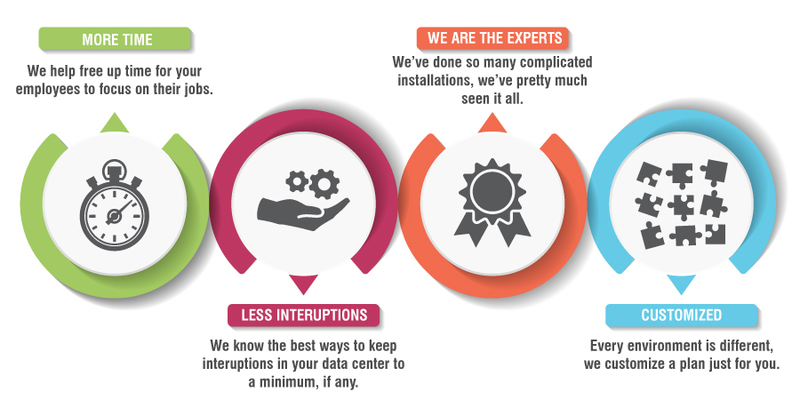 Data center implementations require time and expertise that may not be readily available to you. Our certified implementation specialists average over 20 years of industry experience, where we’ve learned what works and what doesn’t. We apply a best practices approach to IT solution design, data center installation and configuration and provide project management services to implement leading technology solutions for your business. Following proven deployment techniques, we are able to provide seamless integration into your environment. A key part of this smooth transition is providing you with product-specific knowledge transfer of the newly implemented data center solution. We cap off every project with the delivery of a documentation package, as well as a runbook. In today’s complex data center, setup requires more than just buying a piece of IT equipment, plugging it in and turning it on. It requires complex solution design elements to make sure these technologies fit into an already complicated environment. Evolving Solutions works with you to implement a complete IT solution with the right setup for your specific needs and requirements. With access to our Integration Lab, we fully configure your IT solution prior to delivery straight from our facility to your data center. Once delivered, your IT solution is installed by our highly qualified team of technicians. We work with a wide range of companies – from small to large and simple to complex. We make a point to keep up with best practices and certifications in your industry so you don’t have to. Prior to data center installation, we bring your team up to speed on how to use your solution and why it’s the optimal fit for your business. Our project managers are second to none when it comes to coordinating efforts across different teams – both internally and externally – to ensure your IT solution is implemented successfully. After the IT solution is implemented, we provide detailed information to educate your team on the day-to-day management of your IT equipment. This creates a quick transition so you are ready to use your new solution efficiently right from the start. Documenting processes and procedures is critical for future IT equipment management, whether you are adding a new team member or just need a refresher. We put together extensive documentation to make things easy. COPYRIGHT © 2018 EVOLVING SOLUTIONS, INC. ALL RIGHTS RESERVED.